TRULY A RARE FIND! So beautiful – it should be featured in House & Garden Magazine! Nestled at the end of a cul-de-sac with lush greenbelt /conservation area in one of Central Florida best gated, luxury communities - totally private - and only 15 minutes to Disney, Epcot and all major attractions, restaurants, shopping and medical facilities! Very convenient location! This is the Builder/Owner's dream home with all the beautiful trimmings and details you could ever want - on one of the most beautiful lots in this luxury gated community! 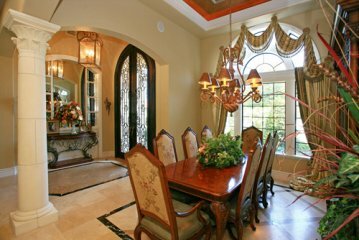 Wonderful custom features, wall treatments, hand-painted murals and detailed woodworking reflect the warmth and superior quality of a charming interior. 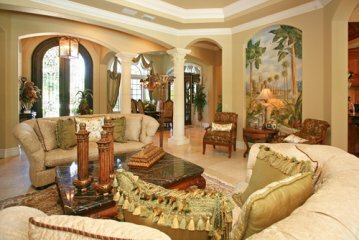 The open floor plan features stately columns defining the living areas and is a favorite among those moving to Florida! Glass walls span the rear of this beautiful home! Wait until you see the views across the rear - Everything overlooks a lush tropical conservation area! No neighbors in the back! Maximum privacy! 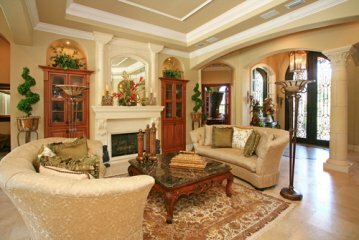 Stone flooring flows through all living areas. 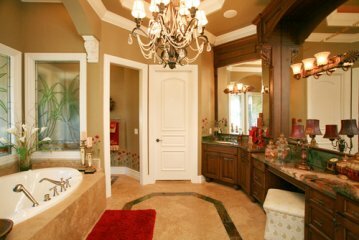 A grand 24’ master bedroom sith lounging area boasts a vaulted, beamed ceiling, with a 25’ luxurious garden bath, his and hers closets and rich Cherry vanities topped with gleaming granite. 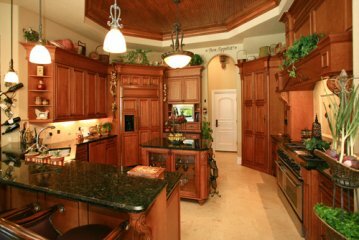 A well-planned kitchen with top quality granite-topped cabinets and appliances offers a snack/serving bar which opens to the family room. The breafast area is nestled in a "greenhouse" style window with mitered corners and overlooks the pool, spa and conservation area! Lovely views for early morning coffee! 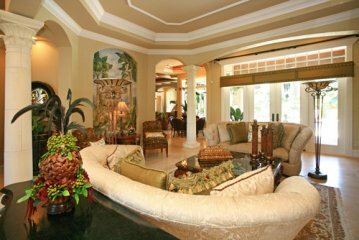 Family and friends will enjoy the 20' billiard room which leads from the family room through a large cased opening . A 14' wide Palladium window overlooks the lush greenbelt - the views are awesome! 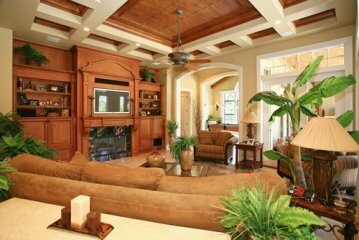 To add to your further enjoyment is a Media Room (or a children's play room - with adjoining bath) on the second floor which one approaches from a rear staircase in the Family Room! For those who need a functional "working" home office, - this is one of the best - designed with a double door entry from the foyer - complete with exceptional woodworking, 12' computer desk, book shelves and lots of storage! You can really work well and be organized in here! 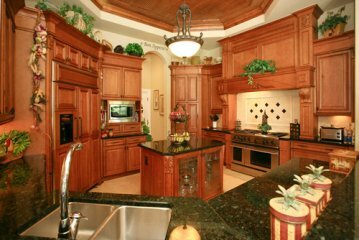 This stunning home offers a well-executed floor plan ! The first floor offers a large Master Bedroom Suite, Study/Office, 2 additonal bedroom suites, formal rooms, family room and billiard room! 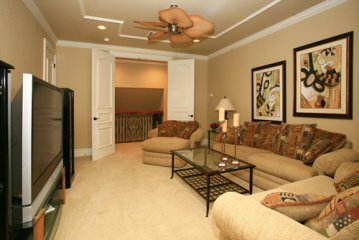 The 2nd floor offers 2 additional bedrooms and the media/game/children's play room. Most people coming to Florida complain about the lack of storage! No worries - this home has plenty of it! 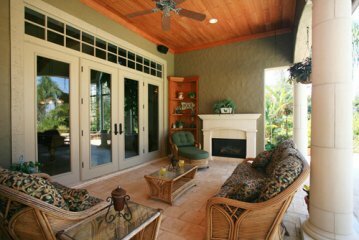 The beautiful outdoor living and entertainment/recreational area is against a greenbelt background! Invite your guests from the North and swim all year long in the free-form heated pool and spa! They will love it! Stunning! Comfortable! Inviting! TOO BEAUTIFUL TO BE MISSED - PRICED TO SELL !